BBQ judges have to travel many miles to get to contests and all at their own expense. Judges are not paid to judge as it is strictly a voluntary process. On the morning of the competition, judges are expected to arrive at a designated hour. Late comers may not be guaranteed a spot on a judging table. 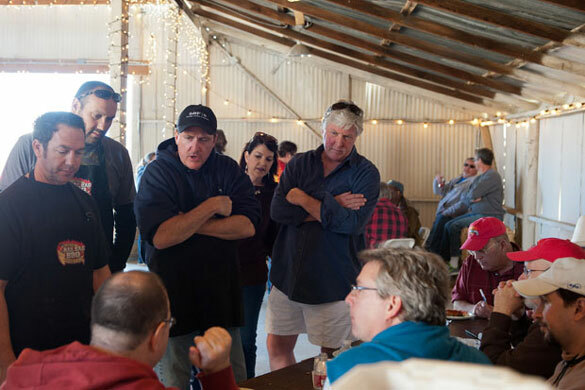 There are numerous barbecue sanctioning bodies in the US (IBCA, PNWBA, KCBS, FBA, MBN, Lone Star, and others) and this article focuses on the Kansas City Barbecue Society (KCBS) judging process. In California, there is a system that is used to evenly distribute judges by experience. After check-ins, the judges are asked to line up from the judge with the most number of contests judged to the judge with the least number of contests judged. Once it is determined how many tables of judges are needed, the officials determine which judges sit at which tables by counting off one judge from the beginning of the line and one judge at the other end until all tables are seated. This is to ensure the most experienced judges will be distributed evenly at all tables (i.e., most senior paired with most junior). Each table should contain roughly the same amount of collective judging experience. Then some redistribution occurs so that no spouses and no couples are at the same table. All of this effort is meant to reduce bias. Any extra judges who didn’t make it on the list to judge can also volunteer as table captains (TC), data entry volunteers, extra table staff, turn-in table volunteers, or designated to switch the box numbers that are submitted. There is a tendency to have more experienced judges as table captains since they can act as guides to the less experienced judges. Tables of six judges are spread throughout the tent. Judges needing more physical room tend to sit at the ends of the table, looking for more comfort over for the next two hours. There are approximately as many judges at a contest as there are teams. For instance, if there are 36 teams, there are 36 judges at six tables with a table captain at each table. The tables rotate on who gets the first six entries. If table 1 gets the first six chicken entries; table 2 will get the first six ribs entries and so forth. Everything is done in rotation to maintain fairness in the judging process. The judges listen to a short 8 minute and 41 second pre-recorded lesson on how to judge BBQ, the KCBS way. The lesson centers judges on what is expected of them. After the recording is played, the judges take the Judge’s Oath. It reads as follows, “I do solemnly swear to objectively and subjectively evaluate each Barbeque meat that is presented to my eyes, my nose, my hands and my palate. I accept my duty to be an Official KCBS Certified Judge, so that truth, justice, excellence in Barbeque and the American Way of Life may be strengthened and preserved forever.” After the oath, judges are released to wander around until before turn-ins but are not permitted to talk with any competitors. They are allowed to say “Hi” and “Good morning” but anything more is frowned upon. When judges return at the designated hour, the tent is bustling with excitement. Summer temperatures in parts of California can run into the hundreds. If you are lucky, you’ll be inside an air-conditioned building. Most of the time, you yearn for a welcome breeze to kick in under the walls of the tent. We like to chat while we wait as cooks on the other side of the wall turn in the fruits of their labor. Table captains line up near the entry with large trays. Chicken is up first. The first six entries are placed onto the tray of Table Captain 1. The TC marks down which team he or she has received to ensure that his table will not judge that team again during the contest. The TC will mark the boxes from 1-6 and indicate the table number for which is in charge of. The next table captain takes his or her six entries and records their numbers, etc. As the TCs bring their trays of meat to the table, the room quiets. Judges now focus. In front of each judge is a bottle of water, a pile of napkins, a pen, a large 11×17 paper “plate” for meat entries and a judges slip to record their scores. The TC stands and reads the team numbers from box 1 to box 6. Judges record that number on their plate going from left to right, top to bottom. They also record the team numbers on their judges slip. These team numbers have been switched so the actual team number assigned to this “judging” team number is not the same as the one assigned to the team. For example, assume a team is assigned Team #20. When Team #20’s box arrives at the judging tent, this #20 is switched with, say, Team #144. The judges score Team #144 and the KCBS scoring computer program links the two team numbers to print the Team name and corresponding scores. This double blind approach means the teams do not know which judges scored their meats and the judges don’t know who’s team the box belongs to. After that, each box is opened and shown to the judges to be scored for appearance only. The judge writes down an appearance score (1-9) and flips his scorecard down so no one can see the score. Once the entire table has scored for that entry, the box is closed and the next box is scored for appearance. Once all six boxes have been scored, the first box is passed to the judge on the end. The judge takes a piece of chicken and passes the box down to the judge next to him. He places the chicken in the box on his plate that matches the number on the top of the box. This is repeated for all six entries. Once a judge has all the entries on his plate, he begins judging them one by one for taste and tenderness. When the entire table is done, the TC collects the judging slips, looks them over for any discrepancies and hands them to the officials who also check the numbers. Judges are free to write down any additional comments they would like to communicate to the cook. For the PNWBA, comment cards are required for each entry. For KCBS, comment cards are optional. Generally, comments cards are suggested when an entry has failed in some way. But sometimes, both cooks and judges also like to comment when a good entry has been judged but came short of a 9-9-9 because of a small noticeable reason. These little nuggets can be helpful for the cook that is looking to win the whole shebang. It can be hard to communicate to a cook what has gone wrong with their entry by just using a single number. So comment cards can be very helpful. Much of the time, I know what’s wrong with my entry before I get my scores back. A judge doesn’t have to write anything down but the fact that he does means he is trying to help. Even if I don’t agree with the judge, it matters what they think because their perception is what I am trying to impress. Maybe the entry isn’t too spicy for me but if it is too hot for the judge, I need to know. 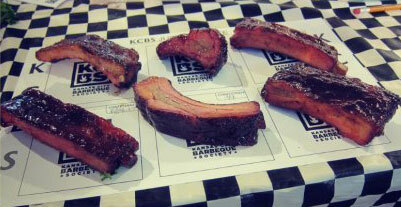 For KCBS, entries are turned in on the half hour. In contrast, for PNWBA, entries are turned in every hour. After each category is judged, judges can save their samples or throw them away. Judges like to talk about the entry they tasted; they try and figure out the components of the recipe and share which entry was their favorite. It’is interesting to see how different or similar experiences can be. Because the last judge to take an entry from the box usually ends up with the last piece of meat, table captains will switch which end of the table gets the first piece. Chicken will be passed from left to right. Ribs will be passed from right to left. That way, no one feels stuck with the worst looking piece. I’m weird. When I judge, I sometimes like take the scrawniest rib and see if it can impress me. Sometimes, it can taste better than it looks. When I judge on appearance, I look at the meat only. Does it look so delicious that I can’t wait to eat it? If it does, it is a 9 in my book. I really don’t focus on how perfect it is but rather if it looks inviting. For texture, I ask myself if they nailed it on doneness. Not over or under-cooked? That’s nailing it in my book as long as they didn’t marinate it to a mushy death. Does the flavor offend? Nope. That’s pretty good BBQ then. There is usually a small break between entries so judges can walk and take a bathroom break. Sometimes we chat a bit with our friends at other tables and see what the entries were like over there. If there is one thing that impresses me the most about a great judge is their ability to accept variations and diversity in submissions. A great judge can appreciate an entry that’s different but is still great BBQ. If there is a disqualified (DQ) entry, the news will drift through the tent. For DQs, the rep has to walk out of the tent and over to the team captain and point out the error. This prevents the error from replicating again for the next entry and settles most disagreements. As a competitor, if I see KCBS rep, Kelly McIntosh outside of the tent during entry time, I run for the hills. He’s not catching me. I’ve been disqualified once for leaving a paper napkin at the top of my box. I closed the white box without seeing the damp white napkin. KCBS rep Dave Lopp came into my tent with the saddest face and showed me the napkin; I accepted the mistake and moved on to brisket. About two months later, I saw him walking down my lane with another white Styrofoam box and I held my breath. Dave is over six feet tall so he’s hard to miss. Luckily, he turned into another camp before he reached me. Whew! It’s the worst feeling and you feel awful for the cook and the poor rep that has to deliver the bad news. After chicken, come pork ribs, then pork shoulder and finally beef brisket. Usually around this time when brisket arrives, I’m done eating BBQ. The cook who can impress me at this point, is a great cook. Brisket is a tough meat to cook and to have it at the end of the contest is brutal. The judges don’t want to eat and the cooks are tired. So the team that can do well in brisket always has my admiration. When brisket is over, the judges are free to pack up and leave. Many stay a while longer to help clean up and chat with other judges. Some wander into the camp and talk with teams. It is a wonderful atmosphere to experience. You can finally buy yourself a beer to enjoy with that wonderful rib you sampled and saved in your cooler and relax a bit. If you’re lucky, you’ll have some company during your drive home to reflect on the great experience you just had. Now that you have an idea what it is like to judge, how does one go about choosing which contest to judge? The primary reason is distance. The close ones are easier to get to and require less time commitment. There are some California destination contests that shouldn’t be missed. Santa Anita offers competition BBQ within the oldest race track in the state and is considered by many to be the most beautiful horse track in the world. The West Coast BBQ Championship is held next to the HMS Queen Mary, a retired grand ocean liner. Penn Valley was held in conjunction with the Cowboy Mounted Shooting Competition and Cowboy Fast Draw. I’ve eaten BBQ there to the sounds of gun shots and horses neighing inches away on the other side of the tent wall. The Wine Country Q offers a wine and cheese welcome overlooking the rolling hills of wine country. 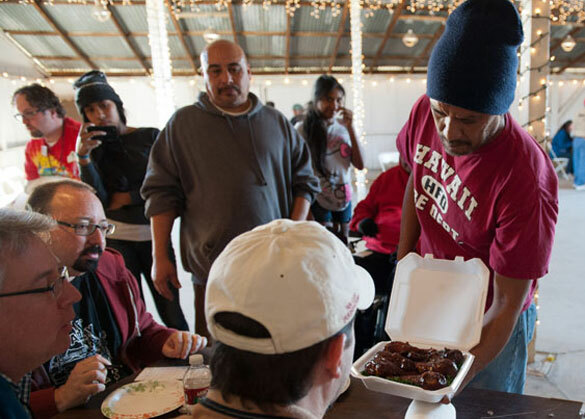 The Bay Area BBQ Championships was held in the Oakland Coliseum parking lot where the mayor, professional baseball players and celebrities like Chesley “Sully” Sullenberger judged alongside certified CBJs. Do you like gambling at casinos? Contests are frequently held at casinos like Pechanga, Golden Acorn, Konocti Vista, Viejas and Feather Falls. Do you like to surf? 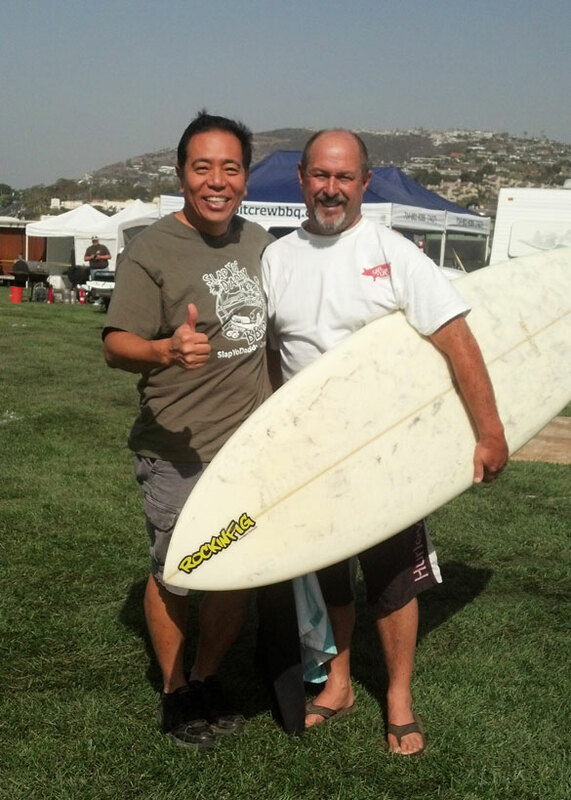 Try judging at Dana Point and bring your surf board with you. Do you like vintage cars? A ton of contests will run along with car shows. There is almost a little something for everyone. A contest can be a great reason to travel some place new. Give yourself an excuse to go someone different and start planning now. Judging BBQ is a splendid weekend getaway and you’ll find some of the finest people around under that big tent. Great article! I was wondering, who won Grand Champion at The Bay Area BBQ Championships at the Oakland Coliseum? Best contest ever. C’mon Chilibrown! You know it was Ms. Goofy, Chilebrown and BD! There are several judging classes coming up this year. Please read Harry’s article today as it is interesting how an old pitmaster approaches judging bbq from the other end of the spectrum. I don’t judge the same way but it does say something about how his mind works. Enjoy!